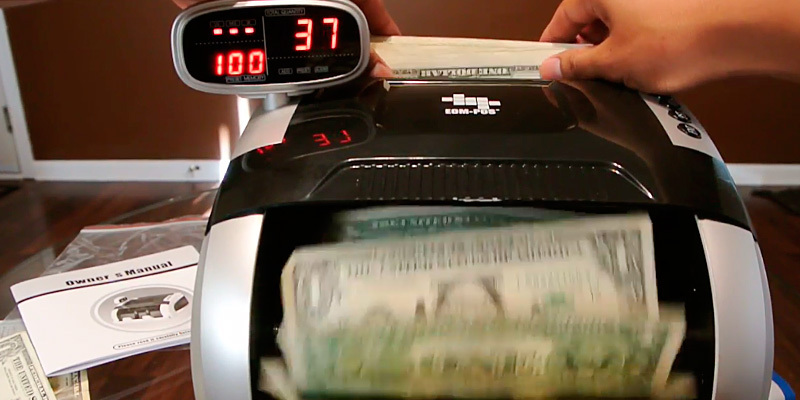 The counter is capable of processing up to 1300 bills per minute. With that kind of performance, the machine will be able to save you quite a lot of time and speed up the entire process, allowing you to make more money in the long run. 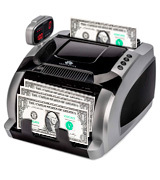 The hopper fits up to 300 newer bills and around 150 older ones. The hopper doesn't fit as many old bills as advertised. What we have here is the fastest money counter first and foremost, making it a great option for all kinds of cash-processing jobs that could really use that speed. This is also one of the better-rounded products out there, so you won't have to sacrifice any major element in favor of that speed. 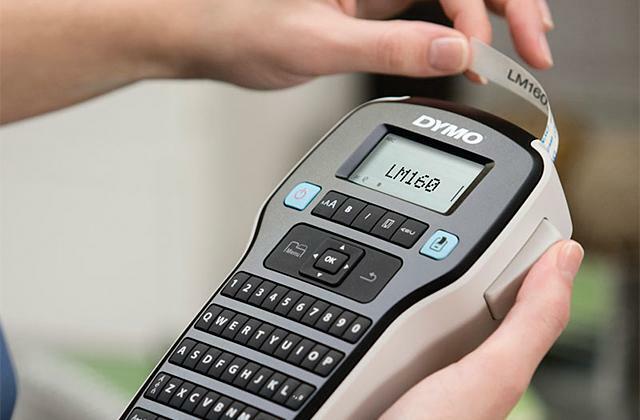 Featuring ultraviolet, magnetic, and infrared sensors, the counter boasts a counterfeit detection rate of 1/800000, meaning there's virtually no chance a fraudulent note will ever end up in your possession. 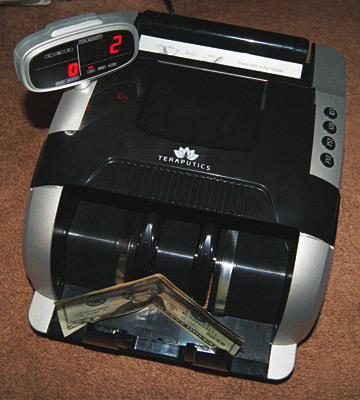 Whenever the machine identifies a fake bill, it sends a convenient alarm and stops the counting process. There's a certain chemical odor that accompanies the first few days of use. The Teraputics TK-950B will prove to be one of the better choices out there for banks and other similar institutions. Speed aside, the controls with the LED display make it really easy to operate and the self-lubricating bearings make the whole thing just durable enough to withstand everyday use. The infrared sensor allows the model to remove the chains, double bills, and half notes from the equation. The product offers the sort of quiet operation that doesn't raise the noise levels above 60 dB. The LED display is easy to read, so you or your employees shouldn't have any issues with that either. Might have some issues with the newest glossy bills. The money counter from G-Star technology will help you bring some basic organization and safety into your life. 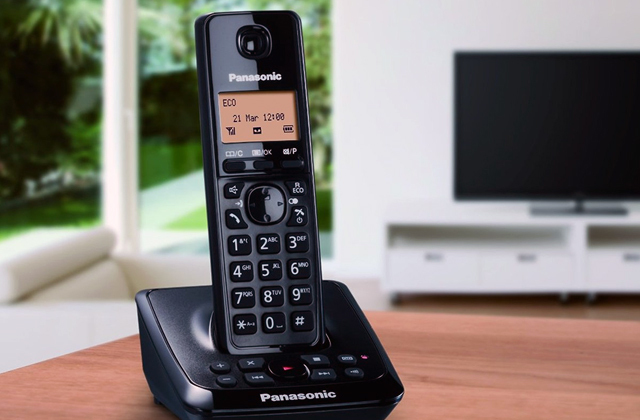 So whether you're looking to make your business more efficient or need a counter for personal use, there is really no reason not to give this model a try. The automatic start, stop, and error clearing functions that make the process of money counting a lot simpler. A sturdy metal construction makes the model durable and easy to maintain. The straight bill path entry reduces the number of jams. Comes equipped with only one counterfeit detection type. 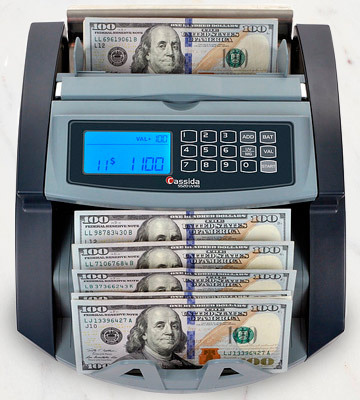 If your business doesn't involve dealing with a potentially large number of fake bills and all you want is to simplify and improve its productivity, the money counter from Kolibri should be able to fit you to a tee. A replacement belt that comes with the counter and six replacement wheels will allow you to turn this model from a stationary to a portable one in just a couple of minutes. The cleaning brush will help you maintain the machine and so do the automatic zero clearing feature and the automatic self-diagnostic system. The instruction manual isn't necessarily helpful. 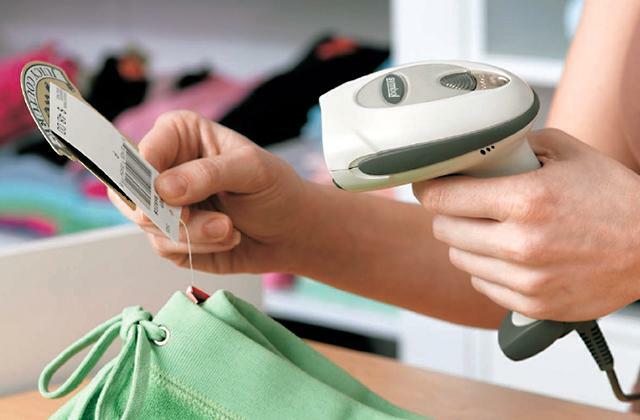 We would recommend the bill counter from HFS to those customers who need a portable model. We would also recommend it to those who are in need of a slightly different counter that allows the customers to view the results of the counting process. 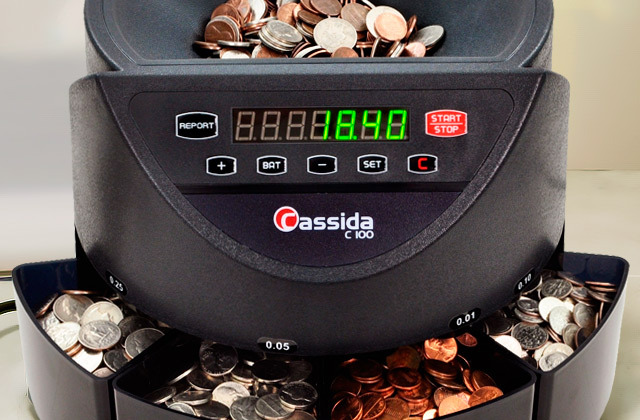 The money counting machine from Cassida will easily prove to be one of the better options when it comes to just about any type of commercial application that deals with a lot of cash. 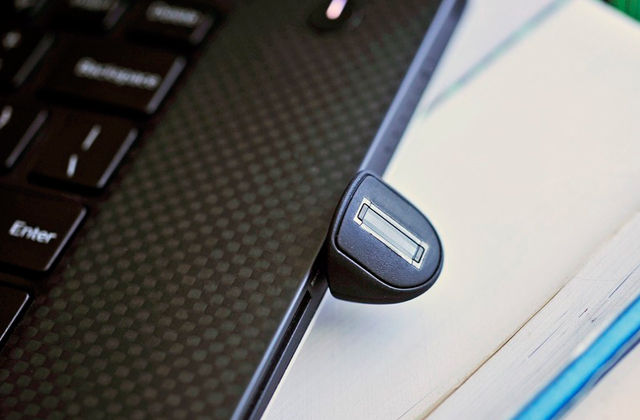 Now, there are a couple of things that make this product so well-suited for the absolute majority of cash-processing jobs. First off, there's the ridiculous counting speed that is capable of processing up to 1300 bills per minute. With that kind of speed, the machine will be able to save you quite a lot of time and speed up the entire process, allowing you to make more money in the long run. Of course, creating one of the faster options on the market, the manufacturers would not have been able to get away with a small hopper. So they made sure to implement their currency counter with a sizable hopper capable of fitting up to 300 newer bills and around 150 older ones. Aside from these couple of specs, what we have here is more or less your standard counter machine. The self-lubricating bearings work wonders when it comes to extending the product's service life. The infrared sensor is there to make sure that the bills are counted accurately. It is also helpful in terms of avoiding errors like chains, double bills, and half notes. On top of the standard Count, Add, and Batch modes, the people behind this model also incorporated an Add+Batch mode that will allow you to save some time. In conclusion, what we have here is the fastest money counter first and foremost, making it a great option for all kinds of cash-processing jobs that could really use that speed. This is also one of the better-rounded products out there, so you won't have to sacrifice any major element in favor of that speed. The model from Teraputics is quite a lot of things for such a seemingly single-focused product. First of all, it is a professional cash counter. 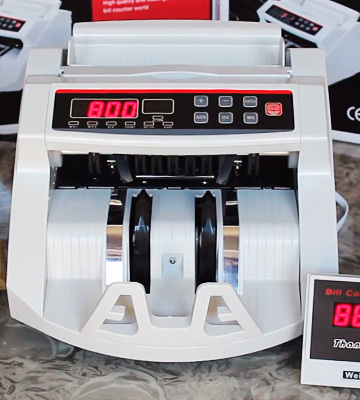 What makes it so professional compared to your run-of-the-mill counter is mostly the counting speed that allows the machine the count up to 1200 bills per minute, saving you time and resources. 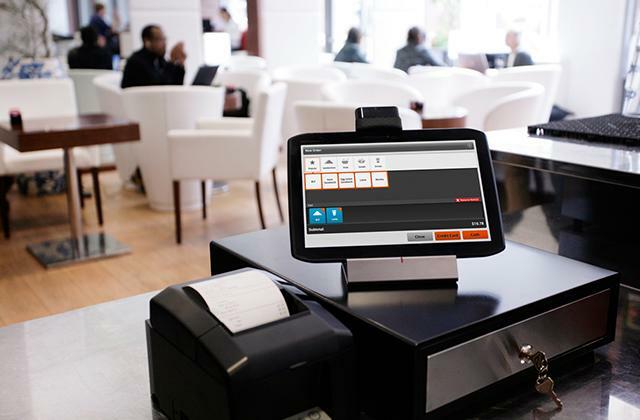 With this model, you will be able to make your business more efficient and, at the end of the day, that is as much as you can ask from any counter. 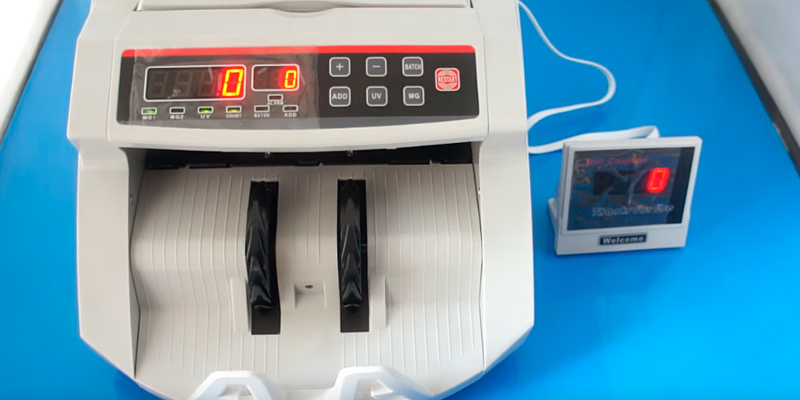 The hopper can process up to 200 bills at a time, so you will have to spend less time pausing the counting process in order to load the notes. Of course, all of the necessary counterfeit detection solutions are there as well. Featuring ultraviolet, magnetic, and infrared sensors, the model boasts a counterfeit detection rate of 1/800000, making it a great option for banks and other similar establishments. Whenever the machine identifies a fake bill, it sends a convenient alarm and stops the counting process. 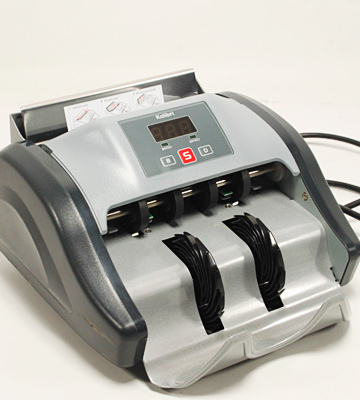 That said, you can install this electric money counter just about anywhere you want as its quiet operation that does not produce more than 60 dB of noise will be able to disturb neither you nor your customers. There's also the energy saving mode that allows the model to count money for 6 hours straight without taking a single pause. All in all, the Teraputics TK-950B will prove to be one of the better choices out there for banks and other similar institutions. Speed aside, the controls with the LED display make it really easy to operate and the self-lubricating bearings make the whole thing just durable enough to withstand everyday use. The digital bill counter from G-Star technology will help you bring some basic organization and safety into your life. 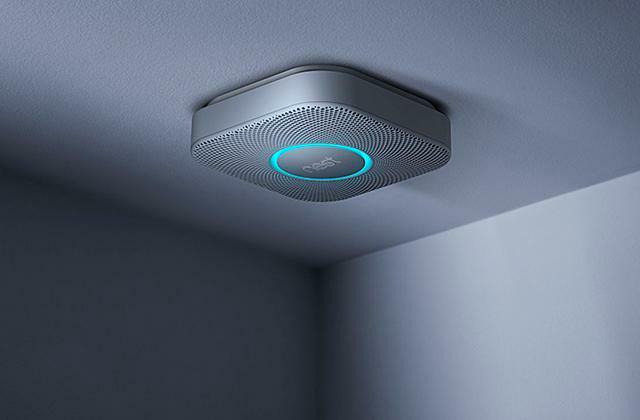 Equipped with ultraviolet, magnetic, and infrared sensors, the model will prove to be a perfectly helpful tool for business as well as personal use. The infrared sensor will do its job of removing the chains, double bills, and half notes from the equation. And the former sensors will make sure that you won't have to deal with fake bills, boasting a remarkable miss counterfeit detection rate of 1/100000. Generally speaking, the biggest issue with UV and magnetic sensors is that they tend to produce a substantial amount of noise but that isn't necessarily the case here as the money counter in question offers the sort of quiet operation that doesn't raise the noise levels above 60 dB. The usual automatic self-diagnostic system simplifies the question of maintenance and extends the service life of the product. The LED display is easy to read, so you or your employees shouldn't have any issues with that either. Finally, the hopper can take a decent load, boasting the ability to work with 150 bills. 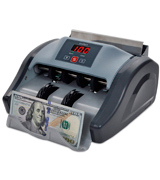 With the counting speed of up to 1000 bills per minute, the model is as efficient as the next counter. 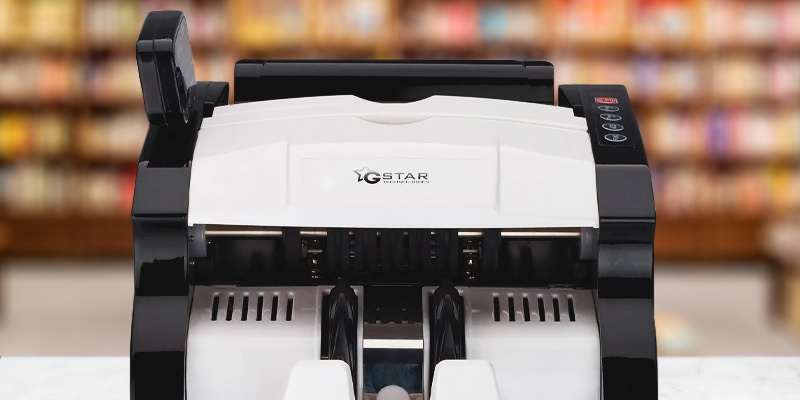 To reiterate our earlier point, the money counter from G-Star technology will help you bring some basic organization and safety into your life. 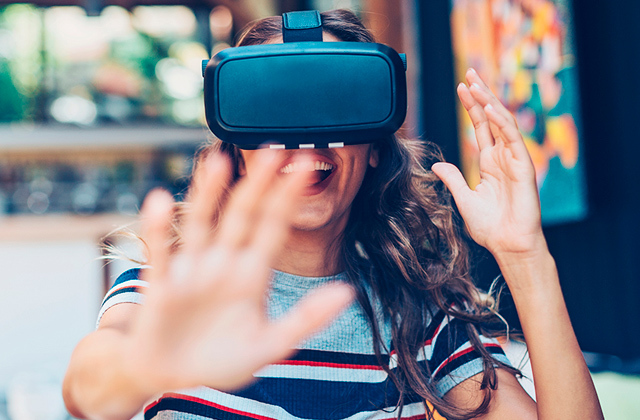 So whether you're looking to make your business more efficient or need a counter for personal use, there is really no reason not to give this model a try. Kolibri Money Counter is all about simplicity. It doesn't include a number of gimmicky features that offer questionable value. 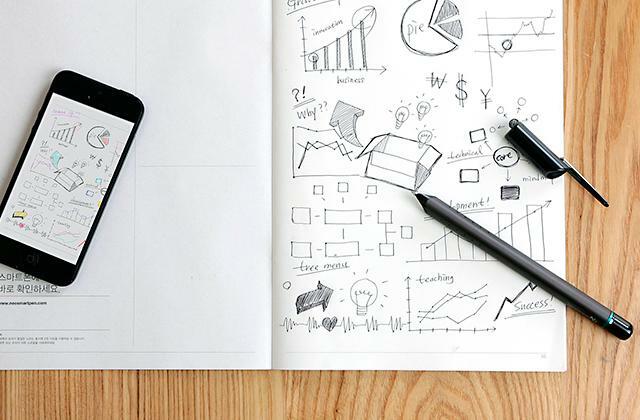 Instead, the product incorporates only the most necessary solutions to make any business that deals with paper money as efficient as possible. There's a simple display with straightforward and convenient controls that will allow you to utilize the product's features. 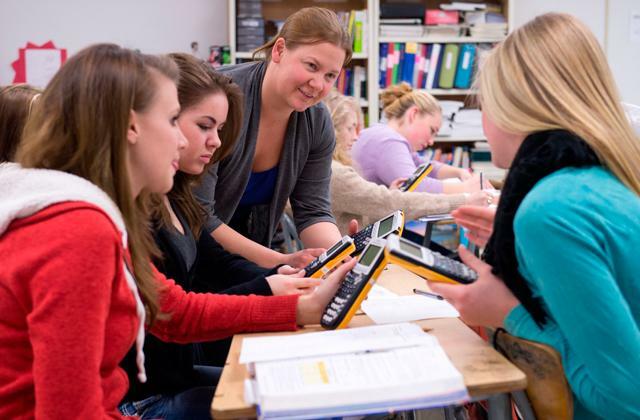 That said, some of those features do not require any involvement from the user, including an automatic start, stop, and error clearing functions that make the process of money counting just that much simpler. Another asset of this machine is its sturdy metal build. 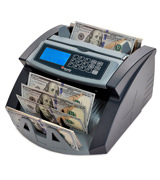 The construction is responsible for making the money counter easy to maintain. Plus, speaking of construction, there's also the straight bill path entry that reduces the number of jams. The counting speed of 1000 bills per minute makes the model suitable for any type of commercial or personal use. The hopper that is capable of fitting up to 200 new bills and 130 old ones will be able to complement that counting speed, providing you with a convenient ability to spend less time loading the bills. Unfortunately, the counter comes equipped with only a single type of sensor. The said UV sensor works wonders when it comes to detecting half, double, and chain notes but it cannot offer the same counterfeit detection rate that you get from a triple-sensor combination. 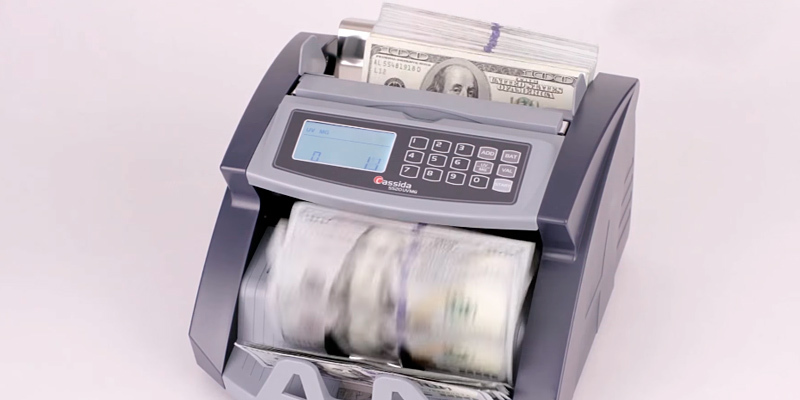 Other than that, if your business doesn't involve dealing with a potentially large number of fake bills and all you want is to simplify and improve its productivity, the money counter from Kolibri should be able to fit you to a tee. HFS Bill Money Counter is a bit of a different model compared to the other products in this review. First of all, it is a portable counter and that presents a number of possibilities that you will be able to utilize with this machine. 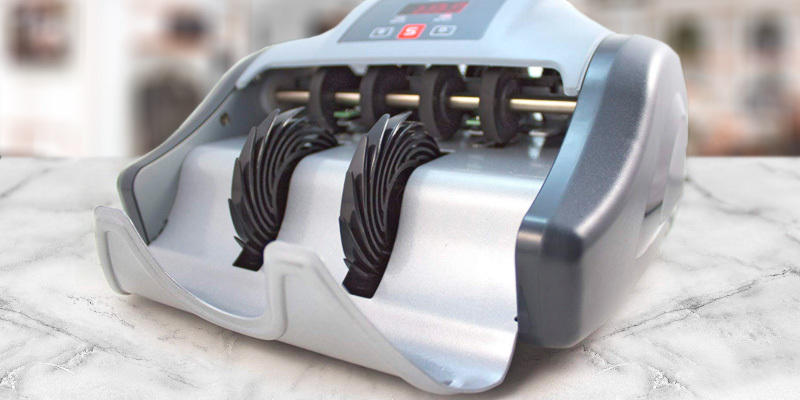 There is a replacement belt that comes with it and six replacement wheels that will allow you to turn this model from a stationary to a portable one in just a couple of minutes. Another part of that package is a cleaning brush that will help you maintain the machine. Speaking of which, the model is really easy to maintain thanks to the automatic zero clearing feature that works with the standard and also automatic self-diagnostic system. Both of these elements do a remarkable job in terms of ensuring the long service life of this portable money counter. Another thing that makes this model slightly different compared to the majority of counters is an external display monitor that allows the second party to observe the results of the counting process, a nice little feature that will prove its worth in a variety of different scenarios. 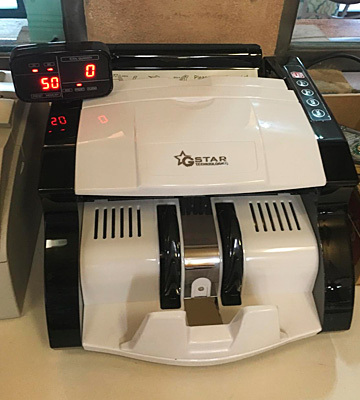 Other than that, what we have here is a standard counter, with a counting speed of 900 bills per minute and a hopper that fits about 200 bills. The batching and adding modes are there and so are the magnetic and UV sensors that detect fake currency and prevent half-notes and double-notes. 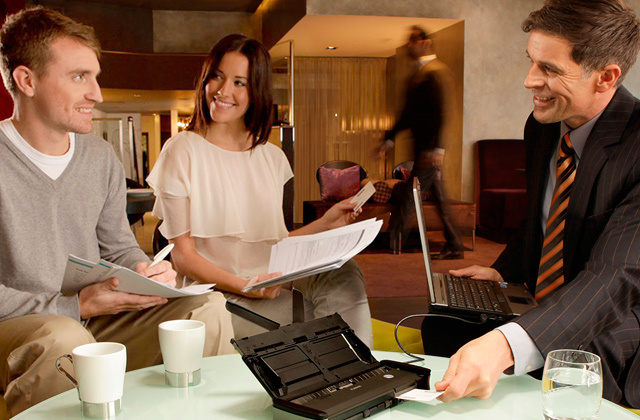 To sum it up, we would recommend the bill counter from HFS to those customers who need a portable model. We would also recommend it to those who are in need of a slightly different counter that allows the customers to view the results of the counting process. What Is a Money Counter? A money counter is probably not one of those machines that need any introductions nor is there a reason to explain what it does as the name itself gives the gist of it away. 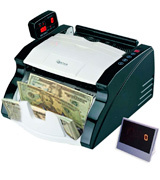 Of course, in addition to any model's ability to count money in a much more efficient manner compared to the manual approach, most counters also come equipped with a number of counterfeit detection solutions, including ultraviolet, magnetic, and infrared sensors. 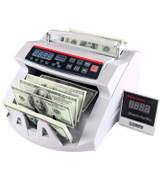 The most important characteristics of any money counter are its counting speed and hopper size. As you would imagine, the counting speed determines the number of bills a counter can process in a minute, with most models being capable of counting up to a thousand notes per said minute. The size of the hopper is the deciding factor when it comes to how many bills you can fit inside the counter. The bigger it is the less time you will have to spend reloading the notes. Other than that, simply take the necessary modes into account and check all of the features that the model has to offer and you will be able to make the right choice. Money is a difficult subject and very few of us really know how to manage it. Which is why we would recommend our reviews of credit report and credit repair services that could very well help you put your finances in order.